and allows you to spend the night on board this dayboat. Equipped with the latest generation of Airstep® technology, this outboard speedboat offers cruising comfort second to none. Unique in its size and its lounge spirit, the extra-large sun lounger to bow is safe and comfortable. 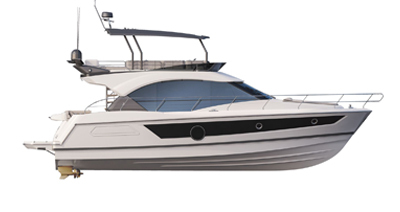 The aft convertible bench seat swiftly offers a second sundeck area across the full beam of the boat. Equipped with two bolster seats, the driving console provides excellent protection. 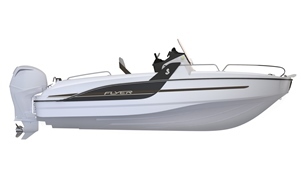 Developed in close partnership with Suzuki, the Flyer 6.6 is compatible with up to 200 HP engine power. She has a 170 litre fuel tank (45 US GAL). CE Certification C8 - D10 - maximum 8 passengers on board. Saloon converts into a double berth. Large forward sun-lounger and aft convertible seat. Cabin with separate marine toilet. Single outboard engine - maximum power 200 HP - Holiday pack Suzuki engine.